Double-decker bus tour pass valid for 3 days, featuring unlimited hop-on hop-off access on Downtown, Uptown and Brooklyn tours! PLUS enjoy a FREE Night Tour, the Hop-on, Hop-off Sightseeing Ferry, entrance to the Museum of the City of New York or New York Historical Society, AND an Eat and Play Discount Card – all included in one pass! 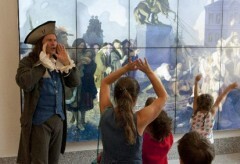 If you want the full New York City experience, there’s no better option than our 72-Hour All Around Town Tour. You’ll have 3 whole days to discover the most popular attractions and unique neighborhoods by land and by sea! Start by hopping on board our comfortable double-decker tour bus, and let our professional guides take you on a journey through The City That Never Sleeps. Your pass includes 4 distinct tour loops in Manhattan, and Brooklyn. This means incredible views of famous sights like the Empire State Building, Times Square, Brooklyn Bridge and much more – all without the stress of navigating your way through crowded streets. And with your included ferry tour, look forward to hassle-free viewing of the Statue of Liberty and Ellis Island up close, with plenty of photo ops! Best of all, you’ll have unlimited opportunities to stop and explore at dozens of popular sights. Grab a bagel and schmear at an Upper West Side deli, stroll through the lush and wild paths of the Ramble in Central Park, or spend some time shopping in the Garment District. When you’re done, just hop on the next bus and be on your way! 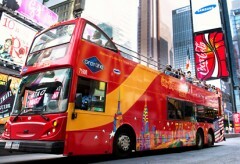 • SAVE OVER $250 on top-quality New York City sightseeing! • Unlimited hop-on, hop-off access throughout Manhattan and Brooklyn. • FREE included Night Tour AND Hop-on, Hop-off Sightseeing Ferry ticket. • Bus tours available with narration in 11 different languages. • Additional discounts on attractions, meals and more – included in your pass! Our All Around Town 72 Hour Tour is valid for 72 hours. A 3-day/72-hour pass is valid for 72 consecutive hours from the first time your ticket is scanned on the bus. Can I use my voucher to board the bus? Reviewed on 9/16/2015, By Samih R.
Excellent service. Only company that provides five tours of NY (instead of four). Guides were informative and funny. Best way to explore the city. Reviewed on 9/13/2015, By Fuai Y. It's a nice trip at New York. The tour bus made the trip much easier. U don't need to wait for a long time and just hop on then u will get a guided great tour at NYC. It was totally a very good memory. Keep it up , guys. See u again. Reviewed on 8/12/2015, By Bob M.
Reviewed on 8/7/2015, By Robert T.
Very convenient to get around NYC and still see the city! The tour guides were good, some better than others. Reviewed on 8/7/2015, By Lidieth S.
Everything is working out perfect so far ! Reviewed on 8/5/2015, By Shelly C.
The tours are fabulous however Updated pamphlets with the correct times of the bus schedule would also helpful.